Nothing like brand new pavement for a little detour on the bike. 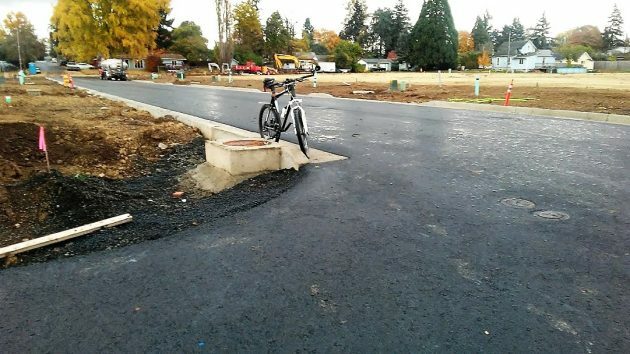 The streets appear to be mostly finished in a new subdivision on the western edge of Albany’s Broadway Neighborhood. I tried them out on the bike last week, and they are fine, as you would expect. The site lies between the Portland & Western (old Oregon Electric) trestle and the western ends of 13th Avenue and a couple of other streets. According to the tentative plat approved by the Albany Planning Commission in 2010, the buildable portion of the 15-acre property — about 6 acres — was to be divided into 32 residential lots. The rest of the land, which looks to be mostly in the floodplain of the Calapooia River, will remain undeveloped. Paperwork available on the city’s community development website says Hayden Homes applied for the permit to allow clearing and grading of the site and construction of improvements for the 32-lot subdivision in February 2015. The city approved the application in July 2017. No word on why it took so long. Hayden Homes, based in Redmond, has built houses in other mid-valley neighborhoods. In May the company won the city council’s approval — over the objections of neighbors — of a North Albany development, the controversial 147-lot Pheasant Run Subdivision, where the tentative plat called for six of eight ancient oaks to be cut down. In the 13th Avenue development on the west side of town, as far as memory serves, no such tree-cutting issues came up. I mourn those ancient oak trees already, and the planet and grandchildren and great grandchildren of all you developers do, too. I hope those oak trees can be saved.